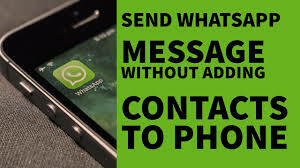 WhatsApp sends a message to your contacts and saving a number in contact list isn't that compulsory now as a new feature serves it. 'Click to Chat' feature that allows users to begin a chat with someone without having their phone number saved in your phone's address book. However, knowing the number of the person you want to chat with is a must. WhatsApp lets you create a link that will allow the user to start a chat with them. By clicking the link, a chat with the person automatically opens. This 'Click to Chat' works on both phone and WhatsApp Web. Readers must note that this functionality works only in individual chat cases and does not work in case you want to engage in a Group chat. Recently, WhatsApp added new features and updates for the WhatsApp groups. The popular messenger app has introduced five new improvements to WhatsApp groups which include group description, admin controls, group catch up, participant search and admin permissions. The WhatsApp users will now have the ability to leave a group permanently. This means that the users will get away with the hassle of being repeatedly added to a group they have left. Along with this, the people who have created the group will no longer be removed from it. After this new update, the users will also be able to quickly locate the messages that have their mention in the group conversation. Another important update called the "Restrict Group" allows WhatsApp group admins to send messages in the group. While all group members will be able to see these messages, only admins will be allowed to respond to these texts. Other group members can only read them.